This may or may not be a “synchronicity” story, but I found it on my old computer harddrive, and thought I’d tweak it slightly and share it here. When I was growing up, we had seven huge old burr oaks in our back yard – gnarly swamp oaks, always dropping pollen and branches and acorns. The seven tree tops grew together into a bonafide canopy, with blue jays, grackles, cardinals, crows, sparrows, bats … and squirrels, tons of them, plump greys and a few little reds. This was a constant part of my reality as my young consciousness formed. 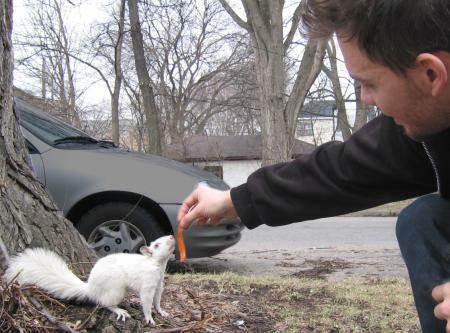 When I was three or so, a squirrel appeared that stood out from the others – an albino squirrel. The albino squirrel didn’t live in our yard, but it was a part of his regular territory. He would come to the back porch to raid the seeds dropped from the bird feeder and do his strange speed-crawling through the oaks’ branches. I don’t know how many years this squirrel was a part of my childhood, but eventually it vanished. 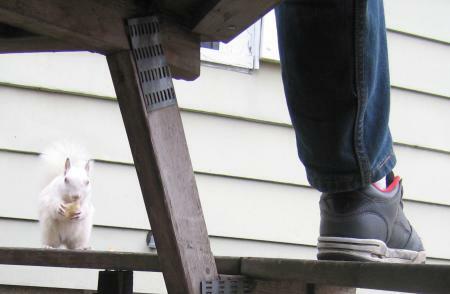 Of course, the disappearance of the neighborhood albino squirrel is not something you notice immediately. It just slowly dawns on you, until one day you finally consciously realize you haven’t seen him around for a long time, so you start actively paying attention and looking for it, and you don’t find it, so after awhile you pester your parents about it and they tell you that the neighbors three houses down had it stuffed and said that they’d found it dead in the road but the next door neighbors were pretty sure the guy’d actually shot it in his backyard. Well, this was unacceptable. 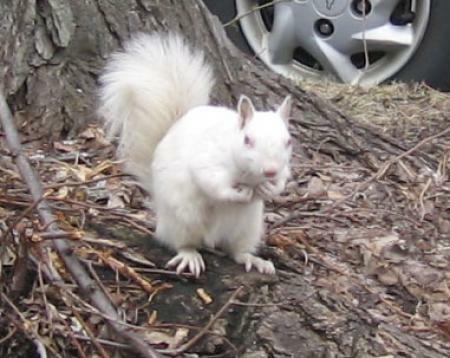 I wanted there to be a albino squirrel, and so I actively waited for it, and basically tried to force one to materialize – I was convinced that if I kept looking for it, I was bound to find – or maybe even create – one. I remember staring out the car window at likely patches of woods around our house, intently scanning the depths of the trees, determined to manifest a white squirrel. But I slowly gave up on this effort, grew up, finished school, went to college, and moved to Minneapolis, where I’ve lived ever since – and I did not see another albino squirrel – for twenty-five years. Around the time I turned 28 , a squirrelly young albino in a brilliantly white coat appeared outside my front door – half grown, and not yet as wary of humans as city squirrels quickly learn to be. Like the albino squirrel from my youth, this squirrel didn’t actually live in my trees (he hailed from somewhere just across the alley), but my little front yard and the boulevard elm tree became part of his scraggly turf – and I was delighted when I saw him around again and again after the first astonished sighting. Jacque was my girlfriend at the time, and lived in the house here – we both started tossing food his way whenever he came around. Jacque decided his name was “Binny,” and it was. At first, Binny kept his distance, but soon he began to come closer, almost within arm’s reach. His head cranked this way and that, the bright eyes, pink and red, examining us and the food from different angles for a few moments. Then he would cautiously move in and grab it with his teeth. If he felt comfortable, he’d stay right there and eat, holding it with his strangely human little white hands. If a car came by or someone came down the sidewalk, he’d run up the elm tree and munch in the safety of the low branches. When we fed him, we talked to him. We started saying his name in a certain way, like people do with pets – soon we could call Binny with some reliability, from all the way across the neighborhood. When he appeared, we’d talk to him a bit, which made him feel comfortable coming closer, and by the autumn of 2005 Binny was sitting on the picnic table out front with us, eating from our hands. He didn’t really hang out with the other squirrels – the greys seemed to kind of shun him, probably because he not only looked different but moved differently. Soon enough the air started getting cool, the leaves all started to die, and we wondered how Binny would survive his first long, cold winter on this earth. We fed him double time, helping him plump up before everything froze. Then the snow flew, the outdoor molecules all slowed down, and Binny was nowhere to be seen for the next several months (during which time I had my mystical experience in California and the subsequent teapot synchronicity). When spring finally returned, so did Binny, and in his presence I found many pleasurable moments appreciating reality in the Now. There was just something soothing and transcendentally-tinged about being able to go outside, call out for an albino squirrel that would soon come hopping from one direction or another to hang out – me reading or thinking, him munching contentedly on some food I’d given him, within arm’s reach, relaxed enough to close his eyes while he savored every bite. That spring, Binny became more than a curiosity, and became, in some strange way, a friend. We would never bond the way I had with my dog, but this was fine – he was a free creature, a wild city squirrel, a free agent. But he knew me, and I knew him, and I swear I knew he didn’t just enjoy my food, but also my presence. And I, of course, enjoyed his. One spring day, my heart lurched when Binny responded to my call and came down from the tree in front of my house looking leperous and tattered – I was momentarily convinced he was dying before I realized he was simply splattered with mud. I was deeply relieved, but a cloud lingered in my heart. One day the following week, I called Binny and he didn’t come. Repeated calls didn’t help. I left the remains of white rice in the take-out box for him if he showed up late. That day at work I made the photo of me feeding Binny into my computer’s wallpaper, finally replacing the shot of me having my mind blown by the sea and light and elk on Tomales Point (the pic in this blog’s header). After work, I took a long skateboard ride with some friends. When we got back to the house, I went around the house into the alley to throw something in the trash – and I saw Binny lying on the cement, still and dead. His head was slightly misshapen, but there was no blood. His body was still warm, white fur was clean and shining in the sun, little hands were held in little fists as always, but never again would I see him bounding cautiously across the street when I called, never again would I share an enchanted sunbeam with my furry friend. I picked him up, held his hand in mine, and brought his body around to the front of the house wordlessly, tears breaking free. My friends grew quiet when they saw what I held in my hands, and in my heart. It occurred to me that I could do what my childhood neighbor had allegedly done – and bring the body to a taxidermist. Couldn’t this be a way to let Binny live on and be remembered? 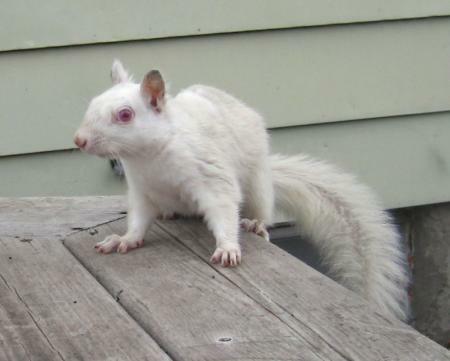 (And how cool would it be to have a stuffed albino squirrel?) But no – this train of thought did not make it out of the station. Binny was a friend, a companion, a magical creature – not a mere thing. There was no way I could imagine turning Binny over to be gutted, skinned, stuffed, posed – nor could I simply throw the body in the alley dumpster and put it out of my mind as quickly as possible, even though I knew it would be easier to go that route, and turn my back on the connection that we’d had – which, now severed, would bring me pain. We had a simple burial. I wrapped his body (actually her body, as it turned out, but Binny’s gender never really mattered anyway) in an colorful old shirt of mine, with a handful of yummy food, some agates, some flowers – things like that. Sage was burned, tears were shed, words were said, and we buried Binny beneath a beautiful white quartz field stone, beneath the elm tree. I never quite got to believing in spirit animals, or power animals, or any other mystical interpretation, but I also couldn’t quite escape the feeling that there was something special about the whole affair – that Binny had come – and gone – for a reason, or reasons. In some way it seemed like Binny’s death – and my choice of whether to throw away, stuff, or bury the body, was somehow important. It’s hard for me now, years later, to really explain what Binny meant to me, what the meaning was, in the co-incidence of her and I. But I can safely say it felt magical to have her in my life. And that I still miss her. WOW! What a beautiful experience. I’d never heard of a wild squirrel being so friendly to humans. I agree that the timing of her appearance and death was important. What her purpose was/is can’t be clearly defined by anyone other than yourself. But, being the witchy type, I’d say she is one of your guides and that you will see her again either in deep meditation, dreams, under the influence of an entheogen, etc. It’s now official. You have the most wonderful and profound synchronicities. This story is just beautiful. Oh wow, I never made that connection – you’ve gotta read the Little Prince synchronicity story that I’ll be posting on here later. Actually I’ll send it to you, ’cause it’s going to be awhile before I get to that one (it happened shortly before I started this blog up). Growing up in Minneapolis, I remember of couple of albino squirrels during my childhood years that came into our backyard. So it was interesting last summer when visiting my mother in the same house where I grew up that she mentioned there was another albino squirrel in the neighborhood. Unfortunately, I didn’t see it. Instead, I fed the chipmunk that lives under the back steps. Chippy, as he’s called, is a creature we don’t see in Florida. Thank you for the story; actually thanks for the blog. I didn’t know that hundred kilometers away from the place I live, just like me, someone also loves to cherish little yet amazing ‘coincidence’ in life. PS ~I’m loving your blog! For 7 years I had a yellow variant of an albino parakeet with red eyes, pink bill and legs and no markings (the variant is called a lutino). I named him Chernobyl, because he looked like the product of nuclear spillage! It was around that time. I was in college and never wanted to forget the lessons learned from that disaster. I really, really love your blog. I found it as it was mentioned in the book “The 7 Secrets of Synchronicity” and wanted to see more. Great story. I love squirrels and was very sad to hear your little friend died. You are very lucky to have had her in your life. Beautiful story. Brought tears to my eyes. 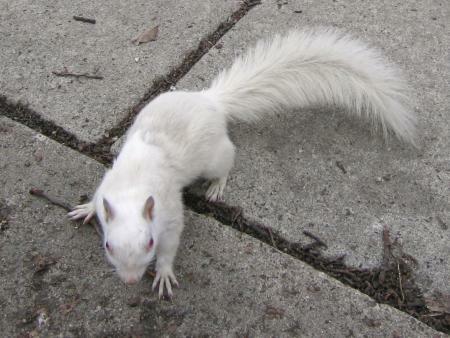 There was a white squirrel around where I lived in Lakeville MN…and seeing it always made the day seem Magickal. I love everything about this story and the moving and wonderful way you have told it. You have immortalized Binny and the precious bond you and she shared with each other. Namaste! have always believed in synchrinocity. and this is another part of it. Saw the title of your blog and I love teapots, a collection I have never had the room to collect, and so I came here. saw the albino squirrel blog and started reading. here we have had 2 albino squirrels. so beautiful and a sign of the universe that it is okay to be different. in 2006, I also started a new journey. stopped being a catholic and became a pagan seeking balance and answers for things like synchrinocity and psychic stuff that has always happened to me. I feel a kinship with you, though I am old enough to be your mom. Funny that on a day like today, when I am in pain from Fibro, that I found your blog and feel a connection over the furry squirrel. but synchrinocity works like that. Namaste. BTW, I have copied your photos of Binny and labelled them as yours but will keep them for when I need to smile. they are so wonder. as a psychic, may I add that Binny may still be close to you. when you see a flash of white outside of your peripheal vision, do not be surprised if it seems furry. What a great story. In the course of our lives we will share our space and spirit with many, for better or for worse….and we all leave each other with something, whether we realize it or not. I count myself extremely lucky for the spirits who have shared my journey and shared themselves with me. The music you chose is awesome! It’s lively and merry nature flies me back to spaces and spirits that had a heart in who I have become. Can you tell me the name or the artist? oddly, I can’t at all remember who did that song – and I looked in my iTunes library for all songs of that duration without luck, so I must have accidentally deleted it sometime after making the video … wish I could tell you, but it’s a mystery to me now! Awww! For a nanosecond, I was disappointed, but there is always a way and I always find it. Necessity is the mother of inventions…. or of finding inventions that should exist! That old show “Name That Tune” gave me the idea to search for “music recognition” services and VOILA! You learn something new every day! 5 minutes and 4 sites later on Audiotag, the Kinks were unmasked as the artists of “Running Around Town”, the song now filed rather fittingly as “Binny’s Tune”. I knew this tune struck old memory chords. Thanks for checking, and thanks for adding more awesomeness to the awesome! aha, my hunch was right – I did a search for “Kinks instrumental” before posting my earlier comment, but didn’t see anything promising so I surrendered. Now I have to figure out why that album vanished from my music library!